Winter Snow Services – Pacific Paving Ltd.
Pacific Paving also offers professional snow clearing services such as snow plowing, snow removal and salting for our clients. Residents of Toronto and other parts of the GTA are well aware of the delays and nuisance that snowfall can cause; snow buildup, when not properly and quickly treated, can cause delays and create dangerous situations. Pacific Paving offers various snow clearing services that are quick, effective and affordable. 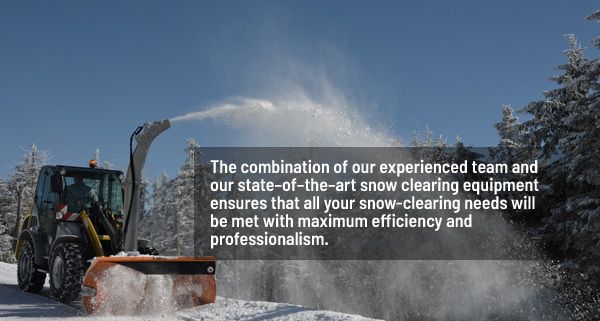 Our team is equipped to remove accumulated snow through snow plowing; our state–of–the–art machinery enables our team to tackle any snow clearing project, large or small. Our team will ensure the proper removal of snow from all types of surfaces, from parking lots to pathways to roads. When heavy snowfall occurs, snow banks can become heavy and dense, making them difficult to remove except by mechanical means. Our team is prepared to relief your property of this nuisance promptly and efficiently with our team of snowplows, clearing any parking lots, roads and pathways of snow buildup, making them accessible and minimizing any disruptions to service. Snow buildup is not the only hazard when it comes to winter. Icy surfaces, such as frozen roads or walkways can arguably be even more dangerous to the standard pedestrians or driver, they can cause slips and falls as well as automobile accidents. For clustered and heavy traffic areas such as walkways and parking lots, it is imperative that these surfaces are properly treated with salting to ensure that the ice is melted and does not accumulate. Having properly salted surfaces will ensure the safety of users and is crucial to avoiding future problems. As a Canadian company, we are acutely aware of how snow during winter months can adversely affect daily operations for many businesses. Our goal at Pacific Paving is to ensure that the properties of our clients are properly taken care of, many it one less thing to worry about.